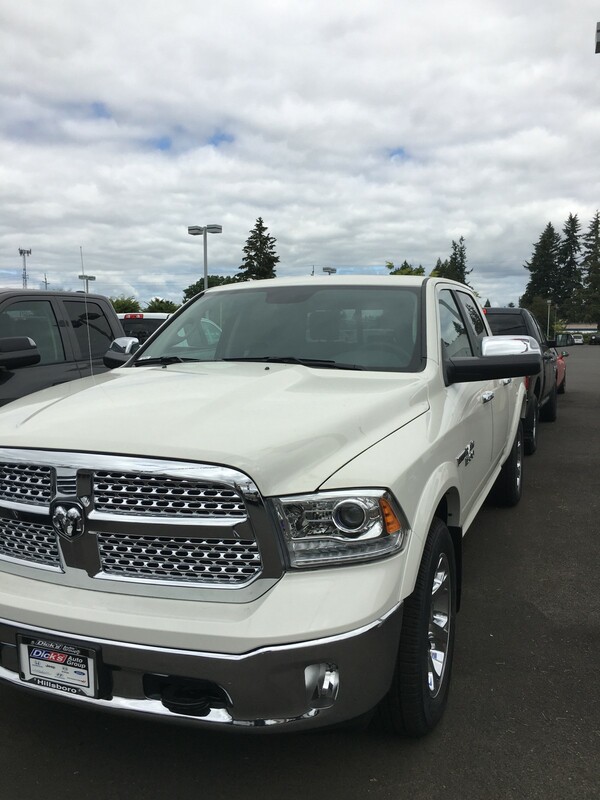 First, we ordered the truck. We looked at everything available. We settled on the RAM 3500. We worried and fretted about the color. Finally we decided a two-tone pearl white with a silver lower would look good with the chocolate RVs that we had been seeing in the dealer lots. So that’s what we ordered. Did we do a perfect job? Not sure. We are already talking about lambs wool covers for the seats even though we ended up with heated leather seats. The interior is pretty dark which is one of our least favorite things since we know it draws the heat of Texas. Anyway, it is done. We’ll see if we like it or not. I think we’ll become attached to the big thing over time. We’ll spend a few hours a week in it while we are here in Oregon. So we will have time to learn to love it before we are in it every day. As difficult as the truck was, the RV was more difficult. This is the living space for when we are not driving. We’ll sleep in it. We’ll cook in it. We’ll hang out in it. We’ll live our lives in it. We went back and forth on which model. We spent some time on the options but ended up with about the same ones we wanted at the beginning. Once we completely, finally decided, we decided to change our minds. And this is with an order that doesn’t really have a lot of options. The biggest problem is with the carpet. Leslie has some strong opinions and these opinions didn’t match the options from the builder. So we went with what they had. We made some minor changes to make our lives easier. 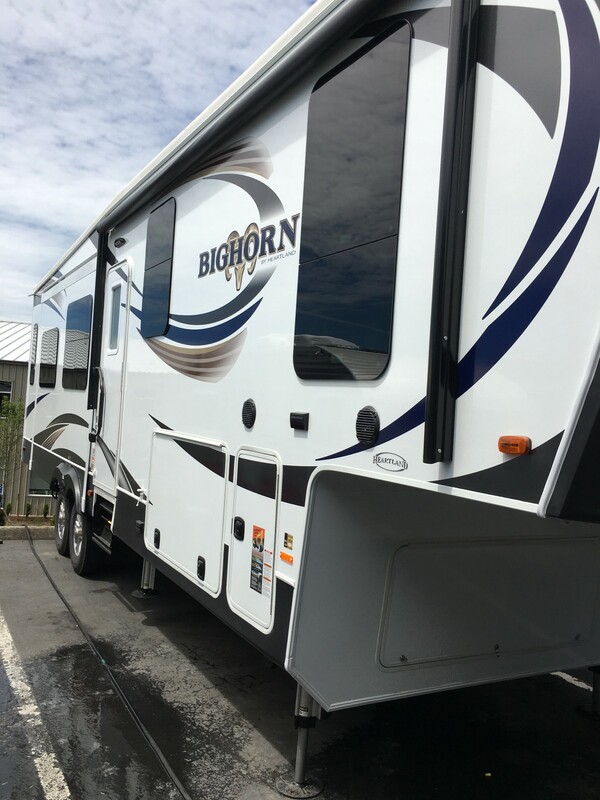 If you see a Bighorn on the road, the chances are our Bighorn will look very different. There are 4 or so major color schemes. 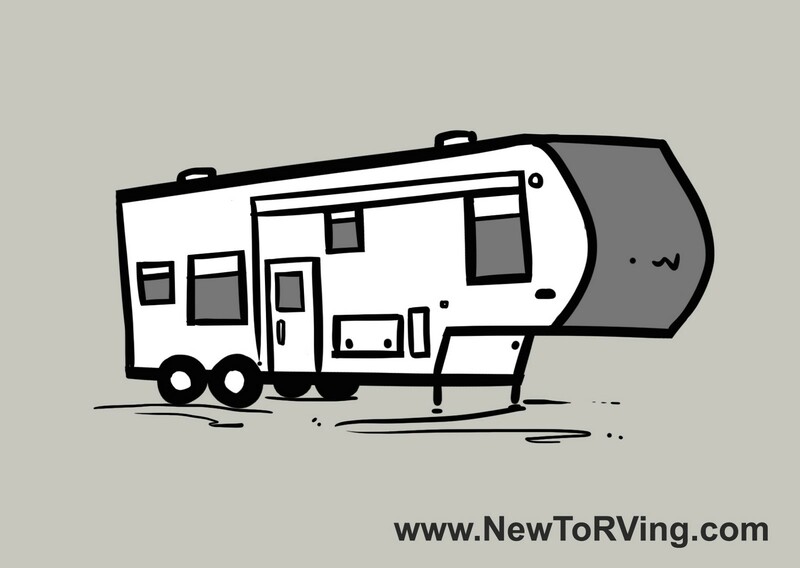 The local dealer and most of the online dealers buy RVs that have a ivory and chocolate paint scheme. It’s dark brown on the front and back caps. Have I told you that we don’t like dark colors because of the heat? The dark colors come with black awning also. This seems pretty silly since you are mainly using the awnings to protect you from the heat. Luckily there appears to be a white awning option if you start with the white paints. So that’s what we did. Our RV will have mostly white with some blue, brown, and silver swirls. The model is the Bighorn 3585 rl. Not the one we started with, but the pricing was similar. We ended up with about 4 more feet and thus some extra storage. This will make a difference in our lives so we are happy with it. It has the steps up to the bedroom away from the entry door which seems like a good thing. Maybe it will help keep the bad spirits out of there. With things like a Yeti package, a heat pump, two AC units, and upgraded brakes, we should be good to go anywhere. We started! After living here for almost 20 years, once again we have started the process of moving out. As some of you know, we’ve done this a couple of times. Once before Jasper was born. Once after he moved out. And now what we hope is the final time. The agent contacted me again to have us come in tomorrow to set some price points. I’m sure she won’t be enthusiastic to set a high price but I’m willing to listen to her. Since she might have a family that might want the house unchanged, we’ll set an “as-is” price, then an after fix-up price. Over the Memorial Day weekend, we spent a couple of days cleaning things out. Both of us have pretty much finished with our closets. I’ve started in on my chest of drawers. We’ve done a tagging of the furniture and stuff that is going into storage. As we get through the historical layers of the house, Leslie continues to find things that will go into storage. I’m still fairly confident that we can stuff it into a smaller storage locker and later into a U-Haul trailer to haul it toward Texas. Today I received an email from Michael Boyink over at Ditching Suburbia. The idea of the email is that he had an event that caused him to remember that we get to choose to be happy. As we move through life, some things will go bad and some things will go good. All of the events of our lives are opportunities to make a choice. He told some stories of families at a beautiful RV park that made the choice to be unhappy. This caused him to remember that we get to choose to be happy or choose to be unhappy. At the moment I am choosing to be happy with the changes that are happening. Leslie is choosing to be happy. Some of these changes will be sad. Such as helping Jasper move on with his life and gain his life-long family. Some of these changes will be fantastic. Such as helping Jasper move on with his life and gain his life-long family. But in all of the changes we will choose to be happy. If you enjoyed this or learned something useful, do us a favor and click on the heart down below. It would help us out.